Seraph Films is a production company founded by director Gene Blalock that produces feature and short films, web series, and music videos. Horror Haiku is a popular weekly short horror web series created by Seraph Films. The company recently finished releasing the latest season titled Horror Haiku: The Museum. Horror Haiku: The Museum builds on the series’ tradition of transforming viewer-submitted haikus into horror vignettes. A haiku is a short poem, of Japanese origin, having a meter of 5 syllables, 7 syllables, and 5 syllables. The latest season invited viewers to submit original, terrifying poems all while exploring the mystery of a dangerous, paranormal museum. With a new host, new poems, and a chilling new mystery, Horror Haiku: The Museum will turn your nightmares into a reality. Visit the official Seraph Films website for their latest creations. 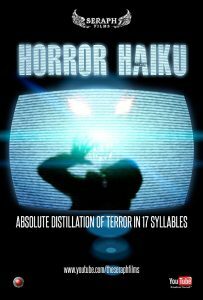 Comments for Seraph Films’ Horror Haiku Overview are now closed.